By the time the fall period rolls around, it starts to get colder across Canada, and the mercury in the thermometer starts to drop as autumn leads to winter and as winter drags on until spring. One of the primary concerns during the winter period is staying warm, and this is why many people opt to spend more time indoors than outdoors. But staying warm comes at a cost that shows up every month in the form of a utility bill. In addition to getting windows in Etobicoke, ON, there are things you can do to stay warm this winter without overusing your furnace. If your windows are drafty, you might be able to fix the problem with some caulking or weather stripping. You can even find such products in some dollar stores these days. The thing with quick fixes, however, is that they tend to solve the problem temporarily. This means that you may encounter a similar problem down the road, and it might be even worse than before. A lot of the energy loss in homes comes courtesy of the windows and the doors. If your windows are not putting up enough of a barrier to keep the chilly air outside from coming in and the warm air inside from going out, then you ought to consider replacing them sooner rather than later. Call a replacement window company to set up an in-home consultation. That way, you’ll know whether your problem can be fixed or if replacement windows are the best solution. It is a good idea to open your windows occasionally to let the stale air out and the fresh air in, but you need to do so strategically during the wintertime. So when it’s really cold outside, avoid opening your windows. And when the temperature is more moderate, open them up sometimes – but don’t leave them open for too long. You just want to leave them open long enough to let in some fresh air. With the right amount of insulation in your home, you’ll be able to retain the heat generated by your furnace. This means that it won’t have to operate constantly. This will also make your home more comfortable during the cold winter months when you and your family will, unless you’re interested in outdoor winter activities, spend more time inside the house. Replacement windows will help with energy efficiency, but window coverings can add even more insulation. This is especially the case if you have window treatments like wood shutters. If you take these recommendations to heart, you’ll be able to keep your home warm this winter without overusing your furnace. It goes without saying that your utility bills during the winter will be higher than during the spring or fall, but there are ways you can reduce the amount you pay. 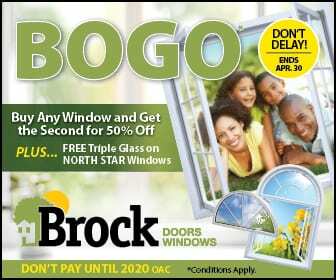 Get in touch with us at Brock Doors and Windows Ltd. when you’re ready to get Etobicoke, ON windows for your home. We offer quality windows from reputable manufacturers, and we install the products we sell. You can rely on excellent service from beginning to end. You’re invited to visit our location in Etobicoke. Our address is 486 Evans Ave Unit 11 Etobicoke, ON M8W 2T7. You can also give us a call at (416) 255-9133.